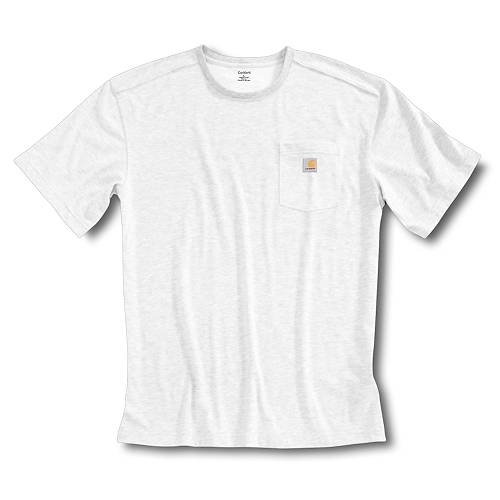 The Carhartt Work-Dry T-Shirt (hereafter called the Work-Dry or tee) is a short sleeved shirt made by the manufacturer as a durable, comfortable work shirt, I plan to use it for backpacking, hiking and climbing. Carhartt also sent a long sleeve version that weighed in at 11.1 oz (315 g). While the focus of this test is of the short sleeved shirt, I often take a long sleeve shirt on my trips also and when this is the case, I will take the Work-Dry Long and will remark on it as the occasion arises. 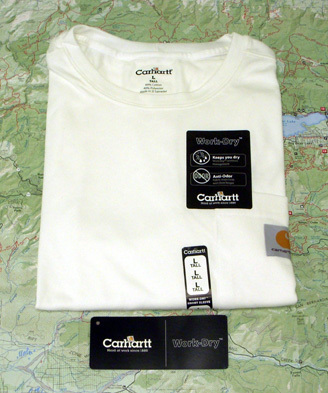 The shirt came with a hang tag and a sticker attached both with the same information, as seen here. It gets its name from the proprietary 6-ounce (1770 g), 60% cotton / 40% polyester Work-Dry fabric that it is made of. It is supposed to wick moisture away from my body, due to the addition of the polyester, no doubt. The fabric is very soft to the touch, but feels more like the poly than cotton. The Work-Dry fabric is said to have anti-odor properties, but they do not say how this is brought about. I will assume that they have used an anti-microbial treatment of some kind. The Work-Dry is constructed with a folded-over rib-knit neck and has a chest pocket on the left side with the company logo on it. As my backpack's left shoulder strap will be over it most of the time, I don't see this being used often. Instead of having a sewn-in tag, the Work-Dry has a printed label at the back of the collar. It lists the size, the materials and the fact that it was made in El Salvador. Inside along the left side seam is the sewn-in care tag. It recommends that the shirt be washed warm with like colors, non-chlorine bleach. Tumble dry medium with no fabric softeners. All of the seams and hems, except for the side seams are serged flat. This makes for a very flat seam that I like to see on a shirt that will have external pressure from my pack against them. It comes in sizes from Small to 4XXL and is available in Tall sizes from Large on up. The availability of the tall size is what made me volunteer to test the Work-Dry tee. I always have to buy XL to fit my height when my torso is actually a large. I wish more companies offered these sizes. Kudos to you Carhartt! The other reason I wanted it was that it was offered in white. 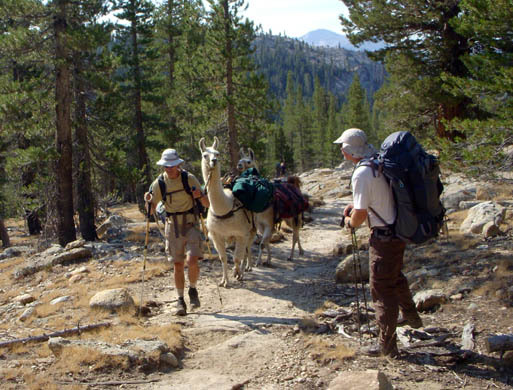 I have been hiking big sections of the southern Pacific Crest Trail and these are quite often in desert areas and get very hot from both the ambient temperature and the sun blasting down on me. I can't wait to see how the Work-Dry tee does on these hikes. And I'll bet you want to hear how it did, so won't you please come back in about two months to read about it? 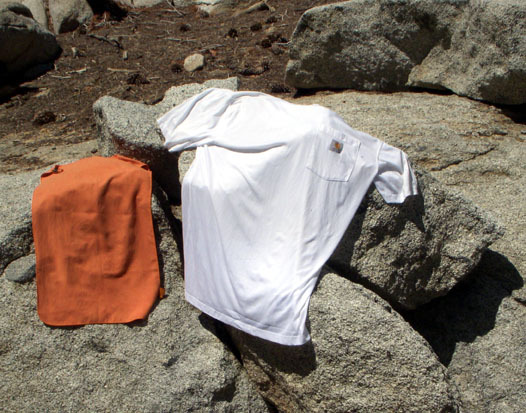 The Work-Dry has proven to be a great shirt for hot summer backpacking. All positive observations so far. Read on for the details. Jenn and I went to Limber Pine Bench in the San Gorgonio Wilderness for an overnighter. The trails were fine, dirt and rock, until just above 8500' (2590 m) where we started hitting lingering snow. Temps were from 67 F to 40 F (20 to 4 C) with enough wind to keep the mosquitoes away. We had 3680' (1122 m) of elevation gain in 6 miles (9.6 km) and a total of 12 miles for the trip (19.2 km). I started with a 41 lb (18.6 kg) pack weight. The picture above was from this trip. I wore it (and the long sleeve version) on a 41-mile (67 km) extreme day-hike on the Pacific Crest Trail through the north-east end of the San Bernardino National Forest and into the Angeles National Forest. This hike had 8600 ft (2621 m) of gain on terrain that ran the gamut of sand, packed dirt, shale, loose rock and even some snow. Temps ran from a chilly 45 F to almost 80 F (7 to 27 C) in weather that went from wet mist (in clouds) to bright hot sunshine. I took the kids to Buffalo River State Park in Minnesota for a practice hike with their new packs. We only went about a mile, and stayed in the campground. The elevation was a whopping 925 ft (282 m) with about 30 ft (10 m) of gain and loss, and the temps were between 50 and 74 F (10 to 23 C). I wore it for two day hikes in Minnesota, all at 900' (300 m) elevation and on dirt farm roads. Temps were from 39 to 67 F (4 to 19 C) and I carried no pack. I walked 8 and 10 miles (13 & 16 km) consecutively. I wore it on a hike with my children to San Jacinto State Park. This was only a six mi (10 km) hike with 300 ft (100 m) of elevation gain but I carried a lot of gear, including my biggest three person tent and a soft-sided cooler. The weight was over 50 lb (22.7 kg). So far the Work-Dry has been a great shirt for hiking. The fit is perfect. It is very nice to have enough length for it to stay tucked in while slamming out the distance. It definitely wicks moisture. On the long hike we were keeping a 3 mph (5 km/h) pace, climbing for much of it, and I was sweating hard thirty minutes after starting to the end 14 hours later. The fabric, while wet throughout, did noticeably have more on the outside than the inside. And when I started out at 5:00 AM I had the long version over it for added warmth. Sweat was wicking through both layers until I stopped to take off the long sleeved WorkDry by around 6:00 AM. On this same hike we climbed up into some solid clouds and spent about three hours in wet mist with streamers of ghostly looking wisps of moisture blowing up the mountain past us. My hair and all the brush on the trail collected water from it and I got soaked as I hiked. The Work-Dry was pretty wet but I was working so hard climbing that I did not want to put on a wind shirt over it. At this point I have no idea if it was wicking or not as it did not matter anyway. 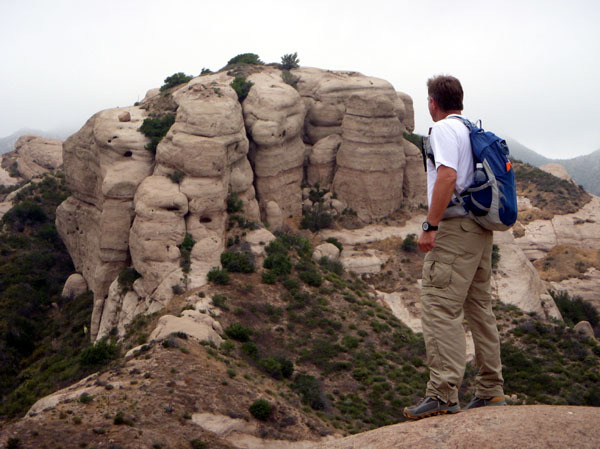 Here is a shot of it on some, and staring at more, of the Mormon Rocks on our way into the clouds. At 12:30 PM we finally climbed above the clouds into bright hot sunshine. The Work-Dry dried off in about an hour due to the sun, the temperature and my body heat. Shortly thereafter it was back to transferring sweat as now I really heated up. And the sunny conditions experienced then and over the trip with Jenn proved what I was wondering about the color and material. I did notice a difference with the white color not absorbing as much heat as my normal green or blue shirts. And the cotton content is great once I was in the dryer heat. (I did wonder what I had got myself into as it was absorbing moisture in the clouds there for awhile�) It gave a nice cooling effect when I would get to the top of a saddle or ridge and caught some wind to evaporate the sweat. I have to say that the anti-microbial treatment seems to be working pretty good as I have not noticed any strong odor retention yet. I let it sit for a day after the 41-mile (67 km) hike to see if it would be rank, but no, it was not. In Minnesota I wore it two days in a row on the dayhikes also but do not sweat as much there due to the humidity and lack of elevation gain. It has washed easily. I do not use bleach on it but it has come clean in each washing. I think the synthetic fibers help in this regard. It is also holding up quite well. There are no loose threads, holes or blown seams to report. I wore the Work-Dry on the following trips during the last two months of testing. 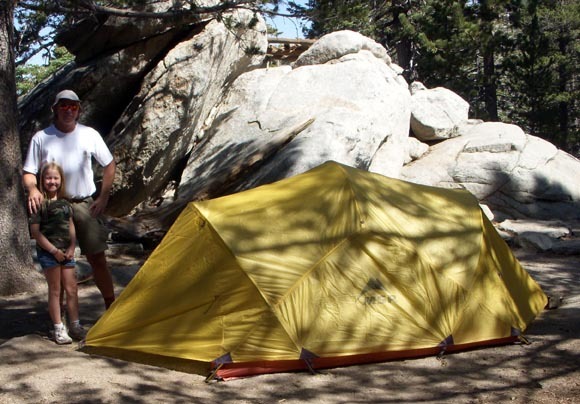 Two days at a primitive campground on the edge of the Mt San Jacinto State Park Wilderness at an elevation of 6500' (1980 m). Temperatures ranged from 76 to 55 F (24 to 13 C). We just did day-hikes from camp, only on one did I carry a pack. 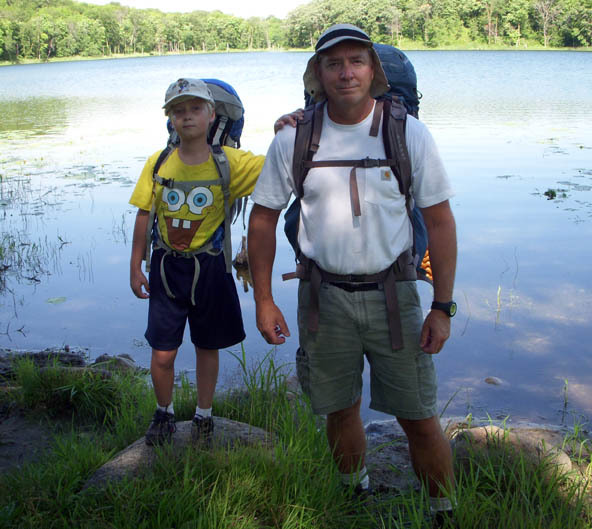 I wore it (and the long version) as I took Emma and Ray on a three-day backpacking trip to Maplewood State Park in Minnesota. We stayed at the Beers Lake Backpacker site the first day and at the Grass Backpacker site the second. The weather was great for two days then rained the last. The temperatures were from 79 down to 61 F (26 to 16 C). We backpacked for 6 miles (10 km) with another few miles (5 km) of exploring. The elevation was 1340 ft (408 m) above sea level. That is where the picture with my son Raymond was taken. The hottest trip was when Dave and I went to do another section of the PCT in the Angeles Forest from Three Points to Little Jimmy campground. It was a 20 mile (32 km) hike with 7000 ft (2135 m) of elevation gain. It was just up-and-down all day in some very hot temps. I forgot my watch but it had to be high 80s F (31 C) or above. Next was two days in Yosemite National Park for a very hot and hard 44 miles (71 km) in temps up to 84 F (29 C) with 7790 ft (2374 m) of gain carrying a 36 lb (16.3 kg) pack. Sweat City! Last was a 79 mile (127 km) 3-1/2 day monster hike from Sonora Pass down through the Emigrant Wilderness to Tuolumne Meadows in Yosemite National Park. This hike saw 15200 (4633 m) of elevation gain with temperatures that ranged from 83 to 43 F (28 to 6 C). My starting pack weight with food and 3 qt/L water was exactly 37 lb (16.8 kg). The Carhartt Work-Dry has continued to impress me. It has been a much hotter than normal summer in my beloved mountains and I have paid the price with sweat. Lots of it. I could not have picked a better summer to test a shirt like this. I have put 264 miles (425 km) in 25 days of actual backpacking, and two days with no pack, just hiking, over the course of the past four months. I have been thankful each hike that I chose the white color. I feel that it really helps eliminate much of the absorbed-light, radiated-heat effect of my darker color shirts. The shirt has wicked wonderfully during all of the very hot hikes I have worn it on. On the trip in the Angeles Forest I actually cramped up from electrolyte depletion. I sweated so much that the shirt was wringing wet. The best thing is when I top out on a high pass and get a blast of air that evaporates the sweat, cooling me off somewhat. That is where the cotton content really shines. Once I get in some steady breeze the Work-Dry dries out fairly quickly, and feels wonderfully cool doing so. That is if I am going down-hill or flat, not climbing, so as not to be producing more shirt-soaking sweat. Whenever possible I rinse the Work-Dry shirt out in a creek or lake, then hang it on a branch or drape it over warm rocks to dry, as seen below. It does not dry as fast as my pure synthetic shirts or my lightweight wool tees, but that is to be expected with the cotton. If I can get it off and rinsed in the late afternoon it will be dry in the morning. But if I get to it later it will be damp still. As warm as it has been this summer I have not minded putting it on damp to start the next day's hiking. And while it dries I have been wearing the long sleeved version as I took it on most of the hikes listed. It has provided just enough warmth as the evening cools off. I am happy they sent it too. I have not used bleach with the Work-Dry yet and it is getting a little "greyed-out". But I am going to have to try some bleach as I may have wrecked it. I draped it over a metal pipe to dry once and got a line of rust stains up the back. It looks pretty bad but as it can't be seen when my pack is on I don't care. I am sure I get some funny looks when it is off. There are still no holes or unraveling seams. The shoulders show no wear from my packs shoulder straps, nor does the waist show wear or pilling from the hip belt. This is in sharp contrast to my wool shirts which do not fare as well in these areas. Again I will state that I love the length of it also. The tall sizing is a major plus for me. If I can't get the rust stains out of this one, I will probably buy another Work-Dry just like it. My thanks to Carhartt and BackpackGearTest.org for the opportunity to test this nice hiking shirt. I leave with a shot allowing some llamas to pass in Yosemite National Park.